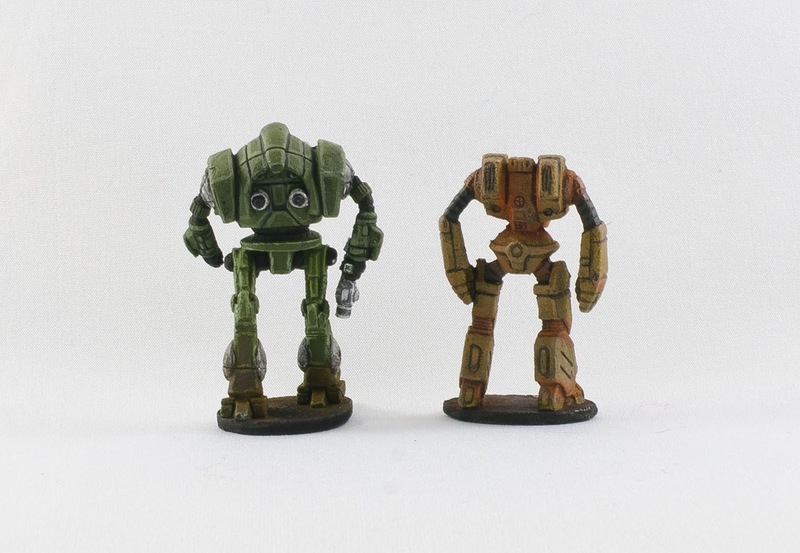 I had considered doing a bit of camo work with the airbrush I have on long-term loan, but I don't think I have the airbrush skillz to do something that fine-scale quite yet. 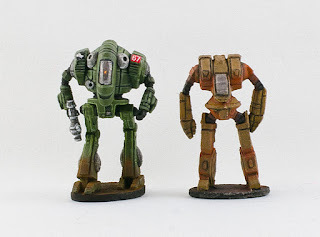 I played around a bit with my weathering powders, with predictable results - they look okay for dust, but my attempts at rusting up the khaki-coloured mech met with limited success. I don't have a technique for using the powders that lets me get fine enough detail for models of this scale. One thing that worked surprisingly well is that I tried to paint the glass fronts of the mechs several times, using different techniques, but I didn't get anything that made me happy. After I had painted them so many times, though, the paint was thick enough that I could scrape it down to bare metal with ease. So now the mechs have shiny reflective cockpits!